So, I'm rebooting my D&D (Pathfinder) campaign, but rather than do a full reboot, I want to try to keep my old game going but bring in a bit of new blood. my plea on Facebook yesterday nabbed me one interested party at least. I'm really open to "guest star" players who want to drop in on a rules light narrative weirdness kind of campaign. for me it's more about co-operative world/narrative building, and eating chips, of course. My current storyline is kind of winding down, so I'm going to play that one out as schedules permit, and have a new player for the end of this campaign and ready, used to the other players for the next campaign. In prep for this one, I have my arcs, my big ideas figured out, but I needed a visual starting place, really. 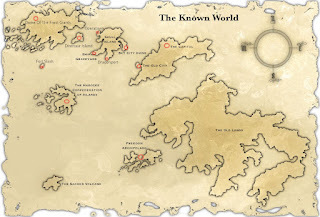 So I googled "blank fantasy world maps" the below image (sans place names) came up first. I filled in the names myself, based on the game so far and my plans for the future. Currently the game has 2-3 PCs (players) and me, the DM/GM... I'm hoping for one more person who can make it once a month, sometimes twice if everyone has time. But anyway here is (based on my indecipherable notes) The Legend for the map below as well. Using the conceit of being from the NPC healer (Oracle) of the party, Gloriana's notebook... the descriptions are meant to be in her voice, what she knows about the places on the map. is the seat of government such as it is in the Known world, the King and his retinue still have tethered to the obsidian tower, the world’s last skyship. There are more than 5 million inhabitants spread out in a low built city (no buildings over 4 stories) that actually covers about a third of is called Capital Island, despite it’s Continent size. is an ancient ruined city that is more overgrown than ruined. the forest has reclaimed it hard. It is rumoured there are many underground caves, and ruined cities below the vine sheathed buildings above. Many an adventurer goes in, few return. There is a legend that Tiamat sleeps at the very bottom, in the oldest of old cities built on top of each other over millennia. Are indeed the ruins of a floating City that crashed to the planet 100 years ago. Sadly, it crashed directly into the thriving City of DwarfTown, killing almost all the dwarves in the world in one fell swoop, as it was the middle of a great festival. Many an adventurer makes their early rep by the wiping out whatever wave of goblins or kobolds is squatting in the ruins on their nomadic trains crisscross Skull Island. is thankfully bereft of dragons (most nights), and home to Pirates, Buccaneers, swashbucklers, and adventurers of every stripe. There is an unwritten rule that is oft enforced, No bounties may be claimed in the city limits. It is a beehive of activity, licit and ill, and the only “Real City” on Skull Island. There is a Governor (currently Sister Mary), a Sheriff (Currently Bess Blackthorn).... Every so often an ambitious cadre of Pirates “replaces” the old government. Sometimes as often as twice a year, though the previous to Sister Mary government had ruled for 5 years, making them something of a dynasty. is haunted, crawling with ghouls, zombies, wights, and the occasional vampire. It also has the best library in the known world. Is really just a black market disguised as a small lazy looking Port home to a oddly disproportionate amount of Drow for so far above ground. There is only one House remaining (out of the 50 that reigned during Operatown’s glory years 3 centuries ago, when the Frost giants still traded with the “small races.”) Since that time there has been a steady decline in working Opera houses as well as an actual working population. Most Operatown folk are transient at best, oft leaving on ship or wagon train in search of “merchandise” for half of each month. The only remaining opera house is A Drow House. Have you heard Drow Opera ? Oy! Has a heck of a lot of Dinosaurs for such a small island, or at least that’s what the survivors all seem to agree on. Even Slash doesn't call it that, but (I do &) it's our nigh impregnable fort that we took far too easily, and haven't been back to in aeons. The Frost Giants used to trade with the smaller folk, until one fateful day 300 years ago, when A pirate Calling himself “the Terror Of The High Seas” said something so offensive during a trade negotiation, that the Giants have sealed themselves into their giant ice walled city on the Arctic continent. Is a loose confederation of small island cultures that share two natural resources in abundance; star metal, and, shivel. Though, their monopoly on both has recently come into question. The Scared Volcano is said to be the home of ancient fire Dragon and her council Of Fire Giants, Elementals, and Efreeti. is home to thousands of freed slaves who have migrated to what is supposed to be a classless utopia, that is anything but classless, it is still the only real democracy in the known world, and is a thousand years old, as a culture. 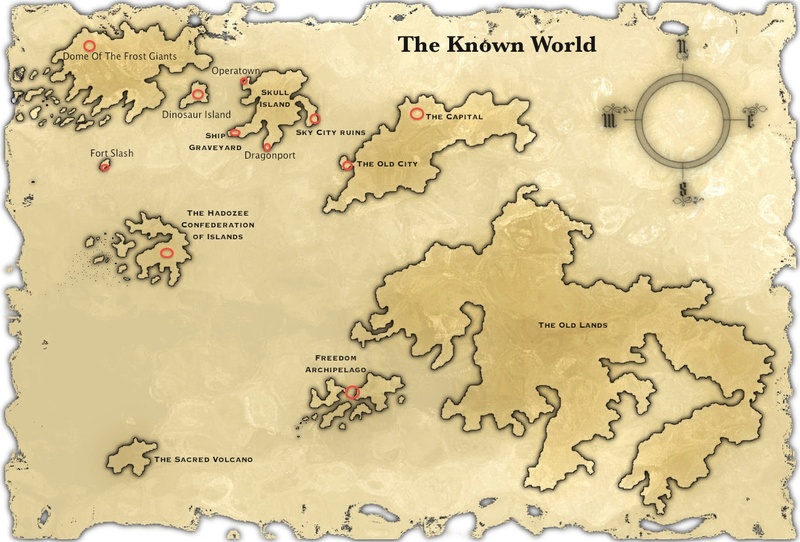 is supposed to be a vast wasteland, but travellers have told tales of many many ruined cities, towns, and even more strange creatures and races as yet unmet in the civilization of the Known world. More Background Writing for my Pathfinder Game.